This brand new ship simming must-have brings six of Europe’s busiest ports together as you captain a wide variety of vessels between Calais, Dover, Rostock, Rotterdam, Hamburg and Gibraltar. Sail a passenger ferry, tugboat, bulk carrier, fishing boat, large ocean cruiser, LNG tanker, cargo container or speed boat on a multitude of varying missions. With a realistic ocean and highly detailed ports, it’s difficult to tell where reality ends and European Ship Simulator begins. 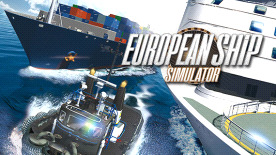 European Ship Simulator breathes new life into the ship sailing genre with its exciting plans for expansions and downloadable content such as new ports, ships and missions.